You've come a long long way, Billy. 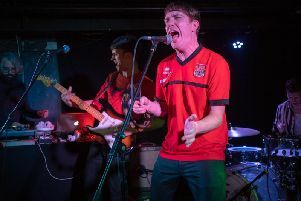 A decade after debuting at The White Elephant as a teenager, Billy Lockett was back Northampton, his hometown, on Saturday night for the first time in two years. Now filling the historic 450-capacity Royal Theatre, he has just announced his biggest headline London show - at the 2,000 capacity Shepherd's Bush Empire. At the Royal, Lockett was joined by Cousin Avi. The local soul-jazz-funk quintet stripped their dynamics down to the bare essence for their support slot, though even with the acoustic setting they displayed the pop heart to their Wonder/Jackson-indebted moves. They did their part with real honesty and charm that easily won over the first-timers. “My Dad told me I'd headline here one day”, explained Lockett during his set. With time it has come to pass. It was inevitable really, considering his stunning development as an artist. No longer the scruffy kid with a guitar, he's the young man sat behind the piano with the moving way with a ballad. A clearly emotional Lockett treated his devotees to an 11-song set that included three new numbers, all of which are helmed by his distinctive, melodic, breathy, verge-of-trembling voice. Wide Eyed is arguably his break-out song and its early showing settled his audience in nicely. He followed it with new single Feel So Good his most commercial dance/pop/R&B song yet, which still sounded great this stripped back. His cover mash-up of Nirvana's Heart-Shaped Box with the refrain from Chris Isaac's Wicked Game has been around for a while now, but is still as charming today as when he first unveiled it. Lockett was on good form on the banter front too throughout, surely bolstered by knowing the crowd was utterly on his side tonight. He finished with an emotional one-two of Empty House and Burn It Down, which caused some in attendance to lose it emotionally – in the best possible way, of course. And before you know it the show was over with fans queuing in foyer up to buy CDs and have items signed. With such effortless talent on display, Lockett can only go in one direction now and Northampton is more than happy to be part of that journey.